The Belfast Beard Co Craic Beard Balm is an all natural small batch beard care product made as the name implies in Northern Ireland. 100% natural made from Coconut oil, Shea butter, Beeswax & Hemp oil and the result is a very pale and smooth beard balm that left my beard feeling softer and gave a nice hold. Unfortunately the weather has been very hot and so it did get a bit sloppy and so I popped it in the fridge and prefered to scrape some out and warm than have it melt. The scent of Belfast Beard Co Craic Beard Balm is very nicely done, it is a blend of Patchouli, Bergamot, Juniper & Pine essential oils and it has created a very nice woodsy and earthy scent that is subtle and I really like the scent. 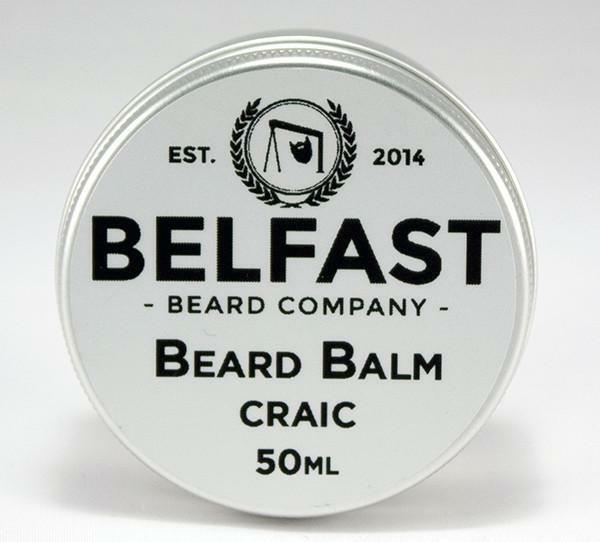 The Belfast Beard Co Craic Beard Balm is available as 50ml for £13.95 and 100ml for £19.95 from the website. The Belfast Beard Company has grown from a love of beards and the desire to make them the best they can be. With over thirteen years’ barbering experience we know our products will perfectly compliment any style of beard. Everything is tested to meet the highest EU standards and they are 100% natural. Our range of premium oils will keep your beard in tip-top condition and help the skin underneath stay flake and irritant free. You’ll also love our balm, which has been developed to sculpt and tame nasty stray hairs with a light hold. It also protects and enhances your beardy good stuff while remaining soft without leaving a caked feel. Style your moustache anyway you want with our wax, achieving maximum hold with minimum effort. Finish off your signature look with a hand made, quality finished wooden beard comb that is set in our signature oil. The Belfast Beard Company is a husband and wife duo, however that is not how it started. Adam met Laura, they sparked straight away, however one thing was missing… a Beard. Laura (The Barber) is a massive pogonophile so Adam grew her a beard. After a short time his face became dry and itchy, he’d had enough and threatened to shave, Laura despaired at the thought so made Adam a bottle of ‘Original’ Beard Oil. Adam rejoiced! No longer was his facial hair dry and itchy… hurrah!! So after a lot of love and a lot of hard work Belfast Beard Company was born. The duo have done everything from infusing the oils, the branding, printing and sticking of labels themselves. Laura and Adam recently got married but the love they have for the Belfast Beard Company is unwavering, they are always trying to make it the best it can be.